The website eMusic, which is second to iTunes in music download sales, announced yesterday it will be offering DRM-free MP3 downloadable audio books through their subscription service. They've launched the beta version of their audiobooks section and are currently offering 1011 audio books from publishers: Random House Audio (about 500 titles), Penguin Audio (about 150 titles), Hachette Audio (about 15 titles), Blackstone Audiobooks, and NAXOS AudioBooks. eMusic's press release announces "eMusic Introduces World's First Audiobooks Catalogue in MP3", which isn't entirely true as we've been selling MP3 audio book downloads for over a year now and have over 1500 titles to choose from. And other publishers such as NAXOS AudioBooks, Christian Audio, Sounds True, The Teaching Company, and Nightingale Conant have made their catalog available on MP3 through their websites. But we won't hold that against eMusic, as this is a welcome development in the trend towards audio books being offered in the universal DRM-free MP3 format so that customers can play their audio books on all portable audio players and not have to worry about compatibility issues or other frustrations surrounding DRM-ed files. At LearnOutLoud we gave their new audio book program a test run. It requires signing up for the eMusic 14-day free trial which gets you 25 free downloads and 1 free audio book. You give them your credit card and you're billed at the end of the trial if you don't cancel. The eMusic (music) download subscription is separate from the audiobooks subscription. When you sign up for the 14-Day trial that includes 25 free music downloads and 1 free audio book download, you are essentially signing up for 2 trials. From there you can choose to continue either subscription. The eMusic (Music) Basic Monthly subscription gets you 30 music downloads for $9.99 per month and the subscriptions and downloads scale up from there. The eMusic Audiobooks Basic subscription gets you one audiobook credit per month for $9.99 a month, and 2 audiobook credits a month for $19.99 a month. The audiobook credits do not roll over to the next month, so if you forget to use your credits within the month, then you lose them. We signed up for the trial and then needed to download the eMusic Remote which is where you browse all their music and audio books. Once you're in the eMusic Remote application, then downloading music and audio books is quite easy. It's basically a one-click purchase when you click their download button and the entire audio book is queued up to download in the eMusic Remote Download Manager. They break audio books up into quite a few tracks. For the 11-hour audio book we downloaded it was 113 tracks which I guess amounts to about 10 tracks per hour. There wasn't an option for a single bookmarkable AAC file, which would be nice for iPod users so they don't have to remember what track number they're on. They do offer their audio books at a bit rate of 64kbs which is higher than Audible.com's highest bit rate of 32kbs. eMusic is digital watermarking their audio book files, which means they are stamping information onto the audio file, so if their files do show up on peer-to-peer sharing networks they can trace the files back to their original source. We're unsure if this watermark contains customer info, and if so, we're unsure what the repercussions would be for customers who shared their files on peer-to-peer sharing networks. Browsing the eMusic store is very fast and easy. They feature 14 categories and numerous subcategories to browse in the audiobooks section. Audio samples are in .m3u which loads and plays in whatever your default player is for .m3u files. Overall it was a good user experience downloading audiobooks from eMusic, and we'll stay subscribers and see what more they have to offer. 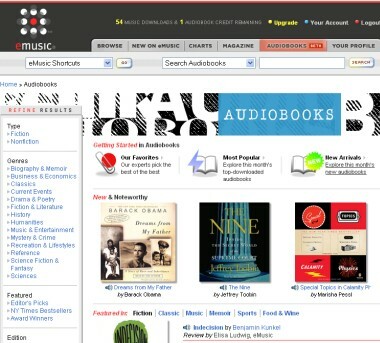 We welcome eMusic to the wonderful world of audiobooks!